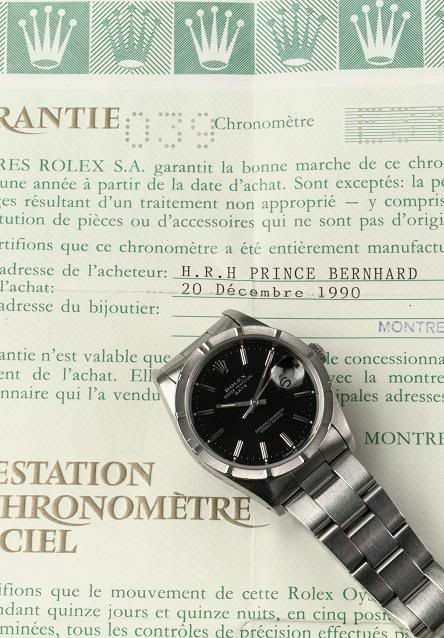 Prince Bernhard (1911-2004), member of the Dutch Royal Family, was an avid Rolex wearer. Dutch magazine Quote published an article in their March edition about the auction of this particular Rolex Date. Christie’s in Amsterdam will auction this Rolex Date on the 3rd of April 2007. Maarten van Gijn, Public Relations & Marketing of Christie’s, mailed me the picture below and stated that I could use it for this blog. I am curious why the Royal Family is auctioning this watch, in my opinion it should be on one of the wrists of his grand childeren. Anyway, according to Quote Magazine, it will fetch around 3000 Euro.